The Kogi State Government is saddened in no small measure by the alleged suicide of Mr. Edward Soje, a level 16 officer and director in the Kogi State Civil Service. He was attached to the Teaching Service Commission. I am appalled by the media reports on Edward Soje’s death. 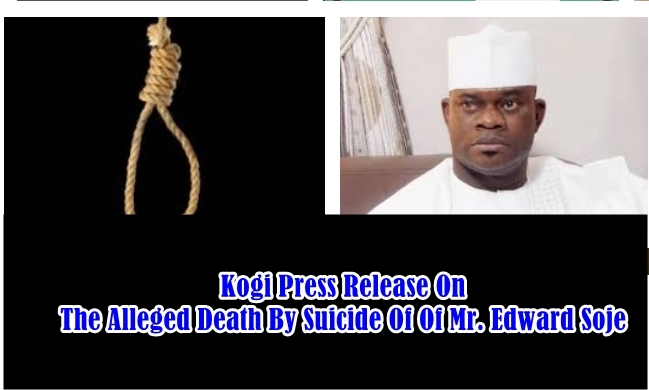 The certainty by the media that he committed suicide, and that he did it due to non-payment of his salaries by his employer, the Kogi State Government. We wonder at this strange certainty. No media house has approached the Service or the Government with any query on the matter. There is also no single shred of proof provided to back up their banner headlines. He continued to receive his salaries till December, 2016 even while the Staff Screening and Verification Exercise was ongoing. His pay was stopped after proof emerged that he falsified his age records. His confession to the offence is on video. Following engagements with Labour which spanned several months, the Kogi State Governor magnanimously commuted the disciplinary action due against certain categories of offenders by grant of pardon. Mr. Soje fell into one of the categories. Pardoned staff were processed for reinstatement and payment in batches. Mr.. Soje was in the September 2017 batch and he was aware of this fact. The Kogi State Teaching Service Commission where he works has forwarded a template for payment to Government and Mr. Soje was aware that he was listed to receive 6 months back pay, leaving only 2 months (August and September) outstanding. Edward Soje was not just my staff, he was also married to my sister-in-law.. His death is shocking, both as one related to him in some way, and one responsible for him in an official capacity. I met with him earlier last week and we discussed his situation, including the progress made in resolving his employment issues. There was no hint of this horrible decision in his demeanour neither did he appear to me as one who was depressed, let alone contemplating suicide. I am therefore understandably shocked by all of this. We use this opportunity to implore the fourth estate of the realm to always strive to verify information before going to the public especially when lives are involved, and to avoid causing unnecessary distress. Facts are sacred and must be so revered. Government condoles with his family, especially his wife and three children. While we will not intrude into their grief over their sad loss, we will stand with them through this.